For those readers who are new to what an Adjustable Gas Block is, take a read through my All About Adjustable Gas Block article. I would consider that article a prerequisite to understanding this review and what an adjustable gas block can fully offer an AR15 owner. I have included some of that content in this article as I believe it is critical to the background. The paraphrased version is that an adjustable gas block allows the shooter to tune the gas pressure on a DI (direct impingement) system. Noting that all DI systems are way way way over gassed, having the option to tune down that gas pressure reduces both recoil and shot recovery times and increases your ability to places shots on target faster and far more comfortably. I am a believer in adjustable gas systems, I have shocked and awed myself and others during testing with the dramatic metamorphosis which occurs from transforming a punchy 5.56 AR15 to a flat, soft, and fast shooting firearm from the same gun just by reducing gas pressure. ABOUT SYRAC ORDNANCESyrac Ordnance was founded by none other than Jason Adams. You know Jason Adams; he founded Adams Arms and invented the AR Piston System. After he left the company, he decided to update the direct impingement system with the same level of creativity by developing an innovative adjustable gas block which addresses the major shortcoming of current gas block designs. FIT, FEEL & FEATURES In general most low profile gas blocks I have tested are pretty high quality however the Syrac Ordnance is definitely on the premium side of fit and finish. Apparently when you do just one thing, you do it exceptionally. Syrac currently offers standard .750” both bolt-on (pinch style) and set screw versions of their adjustable gas blocks which are made in 416 stainless steel and then coated with melonite for extra corrosion resistance and a unique look. Other gas block sizes are in development. Generally all “adjustable” gas blocks work the same. A screw simply pinches closed the gap between the barrel gas port and the gas tube just like a faucet controlling a stream of water. The idea is so simple even a lightly skilled individual such as me has converted three standard gas blocks to adjustable versions on a two carbines and one mid-length rifle system. “THE” most significant problem becomes locking in the adjustment which requires copious amounts of lock-tite to assure the screw will not start to walk out. Over time, it is also a good idea to spot check your setting to assure the screw is not moving. 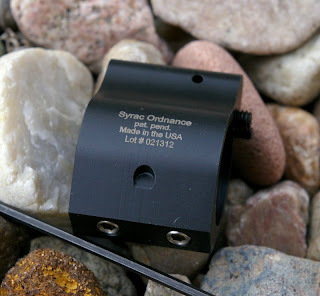 The patented Syrac Ordnance adjustable gas block addressed this issue specifically by developing a locking detent for the screw. A finger actuated push button locks each ⅛ turn click into position with a detent so the adjustment will never move on you even under recoil. The other issue Syrac addressed was to move the adjustment screw from the typical side location to the front. This does not sound revolutionary, however consider no one has done it yet and side adjustment is the standard placement. Side adjustment is not a problem if we all stayed with forends shorter than our gas block length, however it seems everyone is enjoying the extra room longer free float forends provide and those can cover up access to the adjustment. 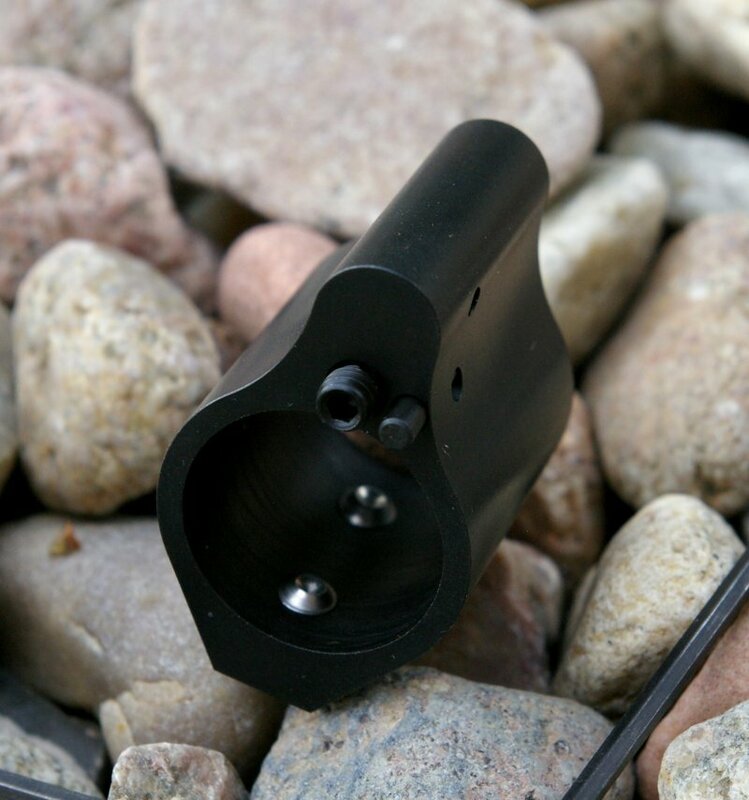 Syrac’s design and kit actually provides two accessibility upgrades with a front adjustment screw that can be accessed on any length forend even if it is a solid carbon fiber forend. 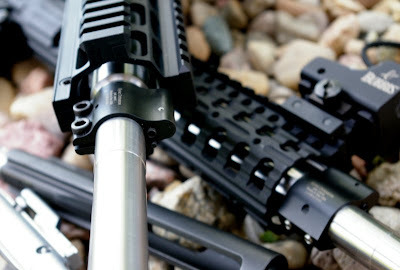 The other forward thinking solution Syrac includes is the very long hex key which should still provide access to your adjustable gas block on even the longest forends. Installation of the Syrac Adjustable Gas Block is straightforward installation as simple as swapping or installing any gas block. I picked up both bolt -on and set screw versions and pinned on a couple White Oak mid-length stainless gas tubes and then installed the gas blocks on my Mega Arms ultralight build with a mid-length 16” Black Hole Weaponry barrel and the bolt-on version on my White Oak Mid-Lengh SDM barreled Aero Precision COPE build. Stressing the point that every gun is its own unique beast, it has been my experience that even two seemingly identical rifles can have different gas tuning settings. Even though both rifles were mid-length .223 Wylde chambers with 1:8 twists, both took much different gas pressure settings to get the bolt to lock back after last round and both delivered different feels of very light recoil after the tuning was complete. Every rifle is different and one reason why I think adjustable gas blocks are so important for more than just the competitive shooter. 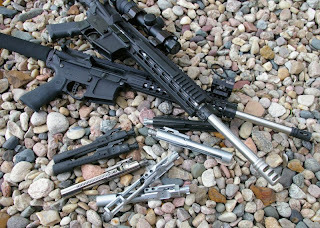 Even if you do not run the gas system a detent or two more than the minimum required to hold back the bolt, such as competitive shooters squeezing out every last drop of recoil reduction, most AR15s can still benefit greatly at a highly reliable state a full turn above the minimum gas setting. For example the notably minimum SAAMI spec’ed $4.99 Herter’s 62 Grain .223 rounds do not function well at all in my White Oak Aero Precision build as the gas port is designed for 5.56 SAAMI spec’ed rounds. On the other hand my Black Hole Mega build, the rounds function just fine as their barrel ports are just a bit bigger to allow functioning for lower spec’ed .223 rounds. Technically the Herters .223 round should not function in any 5.56 chambered AR, however they do because almost all AR rifles are seriously over gassed. This of course begs the question of how much over gassed is your system with ammo at the top of the spec range? Generally I use Herters rounds as a starting point for tuning reliability on my ARs or the Herter’s 55Gr as I have found them to be loaded at the bottom of the ammo SAAMI spec range or in the case of the 62 grain rounds maybe a bit under spec. Switching over to Hornady Steel Match .55gr and 72gr ammo drastically changed the Syrac Ordnance gas block settings on both rifles. The White Oak barrel went from no restriction to screwing in the Syrac adjustment halfway and the Black Hole barrel almost ¾ of the way in. What I recommend is recording the base settings for your standard quality ammo and settings for your cheap ammo - you may get lucky and find that they are the same. To record the reading following the tuning instructions below and then count the number of turns until the adjustment bottoms out. 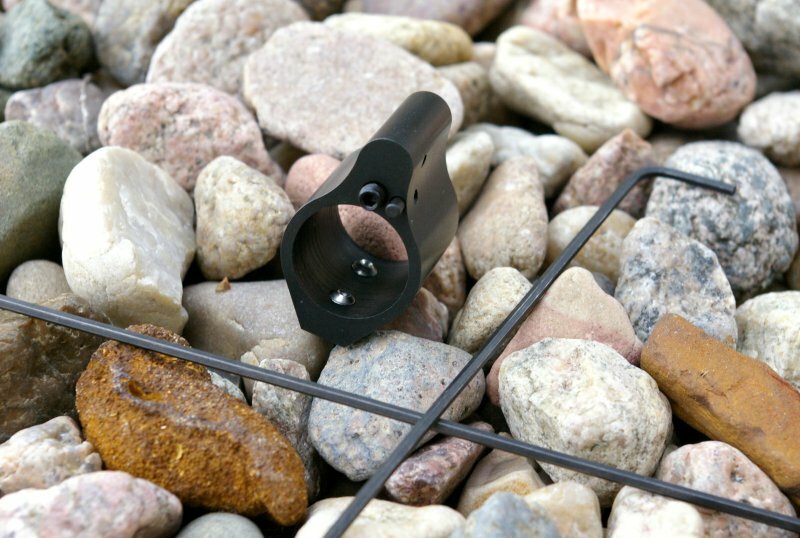 This will allow you to always return to the same tuning point after changing ammo. In a future article I will be testing a couple different bolt styles and weights to see how this impacts gas settings. Syrac recommends tuning on a dry un-oiled rifle with the lightest load you will use. Carefully, turn the adjustment screw all the way down clockwise until it bottoms out, approximately three full turns and then back off one full turn. Shoot the gun with an offhand shooting position. Bolt should lock back. If BCG locks back, complete 6A, if not complete 6B. 6A. If the BCG locks back, turn the screw clockwise in ¼ turn increments repeating the steps 4-5 until the bolt no longer holds back, then back out counter-clockwise ¼ turn and proceed to step 7. 6B. If the BCG does not lock back turn the screw counter-clockwise in ¼ turn increments repeating the steps 4-5 until the bolt holds back and proceed to step 7. Increase in counter-clockwise ¼ turn increments as needed until the bolt holds back successfully three consecutive single round shots. 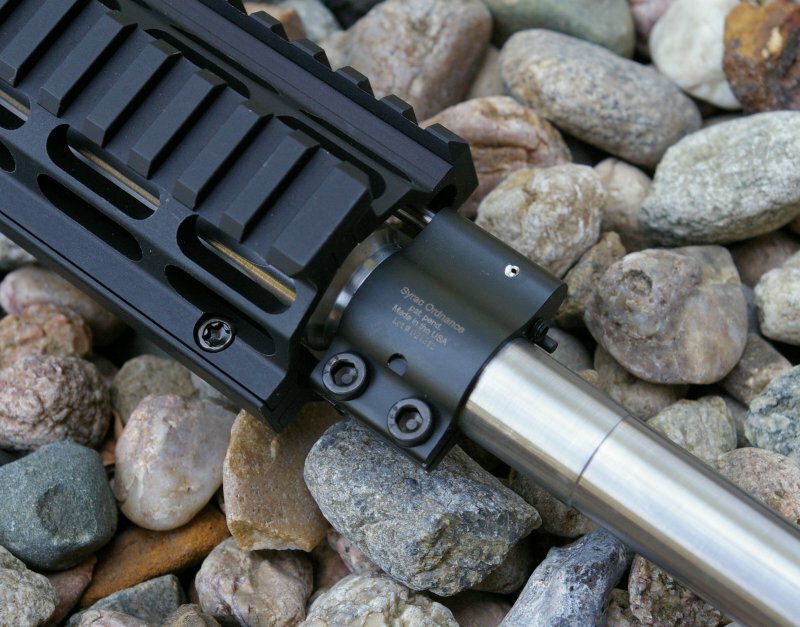 If successful, your AR15 is now optimally tuned. If concerned with assuring reliability with a broader range of ammo, then add ¼ or 1/2 counter-clockwise turn. At this point I have six AR15s with adjustable gas blocks in carbine, mid-length, and rifle-length systems of which I have made three of the adjustable gas blocks. I have learned a thing or two about adjustable gas blocks in the process. It has been my experience that heavy buffers, heavy buffer springs, and M16 carrier groups increase tuning complexity as this extra mass is more sensitive to gas pressure changes. ARs with these heavier components will require a higher gas pressure setting for operation, and will deliver slightly more recoil when compared to systems with standard components. If installed on a defensive rifle I would add at least a ½ to 1 full turn to assure reliability and test three round functioning drills with a couple boxes of shells to assure total functional reliability with your chosen defensive round. Personally I have found that ½ turn extra seems to provide a broad envelope of reliability for a variety of rounds unless you tend to shoot less expensive Tula and Herter’s ammo at the range which are on the bottom of the .223 SAAMI spec range. Contrary to rumors on some forums, so far none of my adjustable gas blocks have required special cleaning or cleaning of any kind. For the competitor, LEO, military, and Joe shooter, the advantages of adjustable gas blocks are obvious; they provide a huge reduction in recoil, faster shot-to-shot sight realignment, less heat back into the action, cleaner long-term function, and overall greater shooting speed and comfort. With the observation that almost all AR15s are over gassed, the transformation is dramatic. Friend and I have noted time and time again that a properly tuned AR15 with an adjustable gas block starts to shot more like a .22 than an AR15. My bet is that if you opt for a Syrac gas block you will feel it was the best upgrade you have made... it looks great, works on any .750” diameter barrel, transforms a snappy AR15 into a light fast shooting rifle, and does it all for around $100. I cant believe no one has commented. This review is uncanny. It is as if I am reading my own words and thoughts. This blogger really has a handle on tuning and the importance of ALWAYS using an adjustable gas system in every single build. I am going to follow this guy. Please BOOKMARK this review if you ever decide to buy an adjustable gas block. His advice is perfect! A couple of things. Having a side adjustment is actually a good thing even with a long rail. You can always(I did in 3 different builds!) find a spot to insert an allen key. My rails ALWAYS covered my gas blocks completely. Keis stopped making my clamp on adjustable gas block that I felt was superior to the Gen 1 Syrac. Now that the Keis block is no more, I see that Syrac has updated the design on their block. The new block(Gen 2) eliminates the loathsome spring pin. I like the new one. But forget about that. The new thing since this blog was written is Syrac's new piston kit. It is insanely light and tiny. Jason Adams has surpassed his first design in spades. Check out a BRIEF tutorial by Jason on tuning his gas system. It has been a long time since I saw something I had not known about! This is the NEW GEN 2 block, BTW. Not as much detailed info like Major P shared, but worth watching new(to me anyways) information on gas blocks. Major P, I bow to your fantastic knowledge and superior writing skills. I would like to meet you some day. Are you near South Florida at all? One situation that was not mentioned in this fine and well presented article, is the addition of a suppressor. The addition of a can WILL dramatically increase back pressure into the gas system. 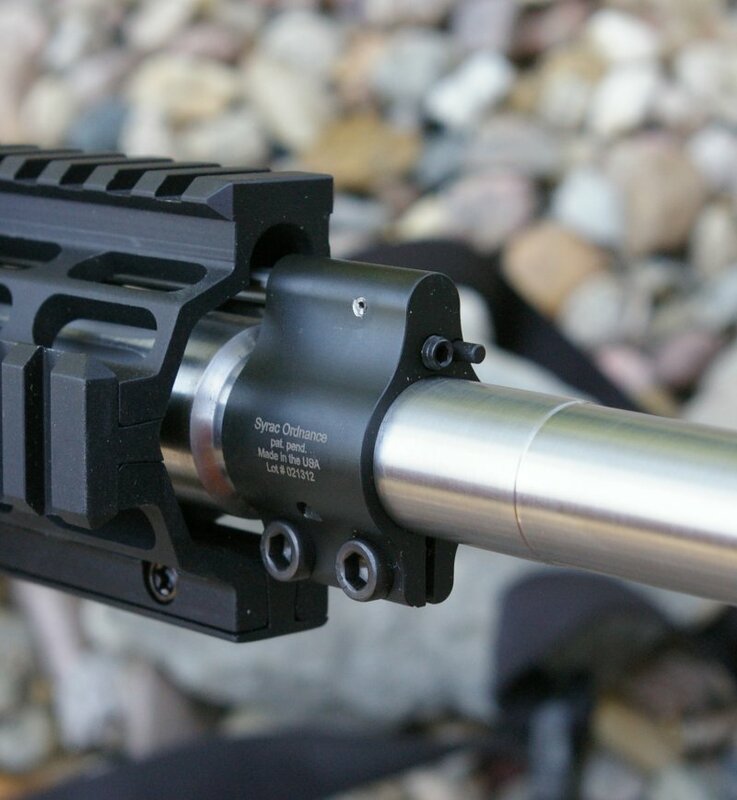 Many mid and high end OEM DI and piston operated AR builders are adding adjustable gas blocks and informing the buyers that cans add undue stress to the gun if the gas is not regulated during suppressed use. Plus an over gassed suppressed gun will push gas into the shooters face and out the ejection port. Yes there is gas busting charging handles that help regulate the gas out the back via the charging handle, but they don't eliminate it completely. Another reason to use adjustable gas blocks. I just got a new Daniel Defense 16" mid-length with a 12" SLiM rail and want to make an adjustable gas block one of my first "upgrades." Would you recommend the clamp-on or set screw version? I believe my stock block is pinned so I'm not really sure what's what. It really does not matter either way. The set screw version is lower profile and will be less likely to interfere with the hand guard. That said, the set screw version rarely are bulky enough to create fitment problems. Still by far the best upgrade you can do on your AR. Also look at Seekins and Precision Reflex gas blocks as well. I HATE set screw gas blocks. PROPER dimples need to be milled into your barrel. I do not condone pinning or dimpling of any barrel, ever. A CLAMP ON gas block is forever. With proper torque and High Strength Red or Green 620 Loctite , a clamp on gas block will never, ever move or shift. I have had serious problems with set screw (piston) gas blocks. NEVER again. I LOVE my clamp on gas blocks! The additional weight may be one or two GRAMS. They never affect a rail fitment and are usually not even seen if you have a proper length rail. There is ONLY one brand I recommend, and that is Superlative Arms. There is NO other adjustable gas block like it in the world. Same price or cheaper than other brands. Ideally you will see the light and just get the Superlative Arms PISTON retro fit kit and be done with AR-15 cleaning and lube except maybe every 1000 rounds. I would scream if I had to scrape one more carbon baked DI bolt carrier!